The FFV has once again undertaken the annual clearing out of the records of tribunal cases and appeals from it's website. For an organisation that claims transparency as one of it's core values, it's an action that opposes that aim. There is apparently the opportunity to request past determinations with a phone call, but if that's anything like how they handle emails (and promises made in them) then don't hold your breath awaiting a reply. The first game I attended this year was the W-League Grand Final. It was a great day, fine weather, good game, right result for a Melburnian with one notable black mark. In an act of incompetence that you would think should no longer be possible, the presentation stage was erected with it's back to the only parts of the ground open to spectators. When patrons should have been cheering for the women who had just completed a brilliant season, they were instead booing the idiots that were treating them with disdain. 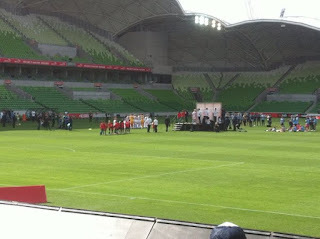 With the game being filmed from the western stand, spectators were restricted to the eastern and southern parts of AAMI Park, bar a single bay of the northern end reserved for the Sydney FC active support. That is an acceptable arrangement, ensuring a solid crowd in the background of the telecast. When it comes to the presentation though, surely portable cameras could have been used to film it with the stage set up to allow the thousands of people who had stayed back for 20 or so minutes to witness it? Many would have probably left upon the final whistle had they known they were not welcome. Would you be surprised if the idiots responsible were to one day wonder why more people don't go to games? I wouldn't. Negus and David Hill pushed for the de-ethnicising of the NSL, and it is in their vision that the NCIP was introduced. Next time someone tries to tell you those policies were only about broadening the game's reach and not in any way racist, reflect on the words above. It's my understanding that not employing someone on the basis of ethnicity is discrimitaion, of a racist variety. I'm not sure how George could spin it around to claim it isn't. 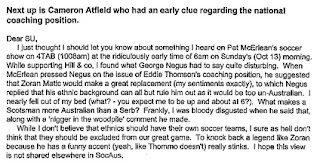 He clearly states the thick accent of Matic is a deal-breaker and that his credentials and merits are therefore irrelevant. 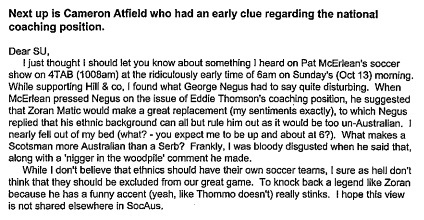 A Balkans accent is un-Australian. British and Irish accents are Australian. These people are even more Australian than those born here to ethnic parents from places other than the UK and Ireland. Once you grasp the importance of these rules you can see why unless the White Australia Policy is restored, the NCIP must strictly be adhered to.